Just Romantic Suspense: It’s Not Like The Good Wife…. It’s Not Like The Good Wife…. I absolutely love The Good Wife. It’s my favorite TV show, and one of the things that the writers of the show are so good at is bringing in both contemporary events and capturing the exciting moments of how large law firms work. The show has an authentic voice which I appreciate. Alicia Florrick is a wonderful lead character, and her life as a “big law” associate and then as a partner at the firm is thrilling and dramatic. Having said all of that, the day to day life of being a lawyer in a big law firm is really not like what is portrayed in The Good Wife. My friends often ask me after an episode: Would that ever really happen? Has that happened to you? Does it actually work like that? Most often my answer to them is no. While there are elements of real life, it is a bit dramatized as it should be. If The Good Wife was true to life, then no one would want to watch it—I know I wouldn’t! But I never miss an episode because the show provides me something I don’t get in real life. That same type of thought process went into writing my debut romance suspense Legally Undercover. I wanted to have an authentic flavor for a big law firm, but without getting bogged down in the often mundane life of a lawyer. In Legally Undercover, Alex Popov is a lawyer at a large law firm on the partnership track. When Alex is presented with a top secret assignment for a client, she is forced to make difficult decisions that implicate her career and eventually her safety. That danger and excitement is what makes Legally Undercover a romantic suspense. But it’s also what makes it fiction. How true to life do you like your romantic suspense? Where do you like the line drawn between accuracy and making for an enjoyable read? LS--I love all the political story lines too. It really is an amazing show. I like romantic suspense stories that I beieve could possibly happen. If it seems like an impossible situation then I usually don't enjoy it as much. reading Rachel's book right now and loving it! Chris, you are so sweet! Chris--Wow, molecular biology sounds intriguing. I'm not really into alien invasion either lol. But I love that there is a lot of variety out there in books to appeal to a wide variety of tastes. I'm really excited to read LEGALLY UNDERCOVER. Congratulations on your debut! Thanks, Carey. I'm ready for your next book! The Good Wife rings true with what the current politicians' infidelities. I have noticed that they always apologize to their wives. Some still stayed together and some ended up divorce. For most, their political careers are over. A life of a lawyer is pretty much mundane with litigation than trials. Only a few cases would end up in trials. That's probably why we love reading and watching court cases (like Perry Mason or Matlock). Wonderful post. 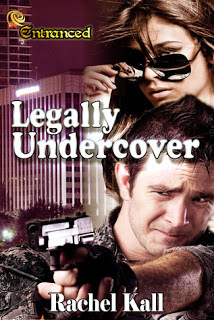 Look forward to reading Legally Undercover.